With leader Martin Kaymer crocked for six weeks following a karting accident and Paul Casey struggling with a rib injury, third placed Rory McIlroy is the new favourite for the Race to Dubai. Just don't tell Lee Westwood, Geoff Ogilvy or Ross Fisher, who are breathing down the Ulsterman's neck. Westwood and Fisher will certainly take some beating coming down the stretch, which should make it interesting when Rory teams up with his Dad in the Dunhill Links later this season. Westwood permitting, the 20-year old Ulsterman will be the clear favourite to lift next week's Omega European Masters at Crans-Sur-Sierre. Quite apart from its status as the first event of the European Ryder Cup race for Colin Montgomerie's 2010 side, it is the scene of the tournament that arguably made McIlroy the player he is today. Trying to become the third-youngest winner in European Tour history, missed a five foot putt for par at the 18th that would have given him the title. But worse was to follow as he then missed again from only about 18 inches at the second play-off hole to hand the title to Jean-François Lucquin. McIlroy reacted with great maturity, racking up six top-10s in his next nine starts to finish the year ranked 39th in the world. His 2009 season has brought him a win in the Dubai Desert Classic, a quarter-final appearance in the WGC-Accenture Match Play and four top performances in the majors, culminating with a career-best share of third in the US PGA last month. Rory McIlroy has set his sights on a double top in the Alps this week. The Ulster hotshot can head the Race to Dubai and the European Ryder Cup Points list by picking up the €333,330 top prize in the Omega European Masters at Crans-Sur-Sierre. The Swiss event signals the start of the race to make Colin Montgomerie's 2010 Ryder Cup side. But McIlroy can steal a march on his absentee Race to Dubai rivals and make up for last season's agonising play-off loss by grabbing his second tour win in Switzerland. Rory McIlroy wants to finish the season as European No 1 before setting his sights on major glory next year. A second tour win of the season in this week's Omega European Masters would put third ranked McIlroy top of the Race to Dubai standings and the Ryder Cup European points list. And with race leaders Martin Kaymer and Paul Casey out injured, the 20-year-old wants to take advantage by outgunning current number four Lee Westwood in the Swiss Alps and avenging last year's play-of loss to Jean-Francois Lucquin. Rory McIlroy bogeyed his last three holes on Saturday to leave Lee Westwood with one hand on the Dubai World Championship and the Race to Dubai title. The Ulsterman was tied for lead with Westwood and six under par for his round through 15 holes before racking up a costly bogey hat-trick from the 16th. Westwood carded a six-under par 66 to lead by two shots on 15 under from Ross McGowan (66) with McIlroy's 69 leaving him five strokes off the pace alongside Padraig Harrington (69) and Alexander Noren (67). He hit every fairway and every green in the final round and lived up to Greg Norman's adage that happiness is a long walk with a putter. 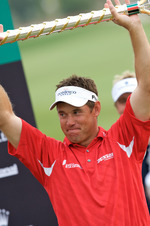 Lee Westwood is European No 1 again and he did it by playing four rounds of almost faultless tournament golf to win the Dubai World Championship by the staggering margin of six shots from Ross McGowan and by eight from Rory McIlroy. Two bogeys in 72 holes (McIlroy made 7), 25 birdies (McIlroy had "only" 20 and 1 eagle), just six greens missed all week (McIlroy missed 13) .... This was staggering stuff from the 36 year old Englishman.